Every Sunday, from now until February, my house will be filled with the sounds of football (not soccer, the real stuff). I love everything about it but I would be lying if I didn’t say the big, brutal hits are my favorite part. I also enjoy tactical, turn based games, as well–the mind games involved, in outplaying your opponent and setting up big plays, 2-3 turns away. Blood Bowl 2, developed by Cyanide Studios (based on the board game of the same name by Games Workshop), is a game that combines football and RTS, finished with a Warhammer paint job. Unfortunately, Blood Bowl 2 drops the ball just as often as it scores. In the world of Blood Bowl 2, one team of 11 players attempts to carry the football to their respectful endzone while the opposing team attempts to stop them and retrieve the ball themselves. Each player has different skills that affect play, with some more likely to complete a pass, catch a pass, or make a tackle. Sounds familiar right? Well, unlike a game of say, Madden, gameplay is similar to a turn-based strategy game. On each turn, you align your players to maximize your potential for success, keeping in mind that different positions have different attributes and movement allotments. Want to protect your “thrower” so he can complete a pass on the next turn? Bring your lineman in one by one to form a barrier. Want to run the ball but worried about defenders? Send your “blitzers” out to knock out the competition. Each decision you make has to be weighed against what your opponent could potential do. 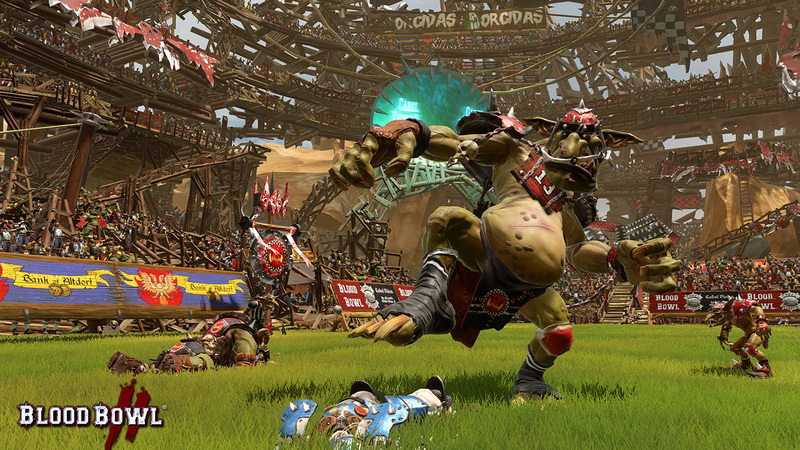 Further separating Blood Bowl 2 from its usual comparisons is its use of the Warhammer license. The teams are comprised of the different races of that world, ranging from Dark Elves to violent Orcs. Each team excels in different circumstances, with Elves being great at passing and running, while Orcs prefer maiming and killing their opponents. 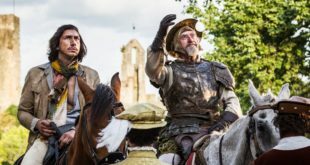 (Editor’s Note: Wait… maiming and killing?) Why yes, Mr. Editor I did say maiming and killing. Remember earlier when I mentioned how much I love the big hits of the NFL? Well, Blood Bowl 2 takes that a step further. Instead of tackling the ball carrier, the defense has the ability to attack any player with a chance of taking that player out of the game for good. The hits are animated to show the painful impact and playful squirts of blood when an Orc decides to take out a puny human. The violence is so over the top that it results in cartoony, slapstick that I never got sick of. Speaking of over-the-top and cartoony, each match is commentated by Jim and Bob of Cabalvision HD. The ogre and vampire duo, are perfectly voice-acted, even offering more insight than Cris Collinsworth. (He’s a sports guy, nerds!) 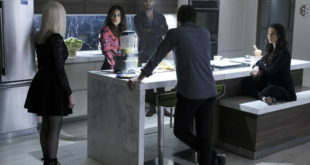 Besides commentary on the game, they also fill in lore about the world and are the only threads of storytelling throughout the single player “campaign”. I know what you must be thinking at this point: “Blood Bowl 2 sounds awesome so far.” It would be, if it was for its reliance of random dice rolls and god awful wait times. After positioning the players before but before taking an action, you’re required to roll digital dice (*see random number generator). Want to tackle someone? Roll the dice. Want to pick up the ball? Roll the dice. Want to throw the ball? Roll the dice. Want to catch… you get the point. Everything is governed by chance and even though you can maneuver players around to increase your odds, you never know what you’re going to get. This mechanic makes all the time spent planning out your moves feel useless. Making matters worse is just how long each match takes. A complete match is 16 turns for each side. Most matches lasted anywhere from 45 minutes to an hour. Not to mention that far too often the AI would pause and take an extra minute or 4 before making any move. The slow pace, and prolonged matches resulted in a strategy of taking the ball down the one yard line, protecting the runner and then ending my turn over and over again until the opposing team was close enough to threaten. At which point I would score and hope I’d only left them with a turn or two. 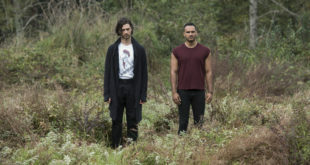 Multiplayer helps relieve this frustration by introducing a human component which tends to play much faster, but also introduces its own issues. The teams in Blood Bowl 2 are incredibly unbalanced, with some teams lacking crucial abilities such as throwing the ball. This results in matches usually featuring the usual suspects of over powered races. There’s a chance that as the game gains a community that players will figure out winning strategies for every team but for now it seems like a no brainer to pick the teams that allow you more options. Finding matches is also a headaches. While, I applaud the inclusion of highly customizable leagues with up to 128 teams, the exclusion of a simple quick match is infuriating. If I want to get into an online multiplayer match, I have to first create a team, then join a league and hope that someone else in that league is online at the same time looking for a match. Needless to say, I wasn’t running into opponents at a frequency I’m accustomed to with an online game. 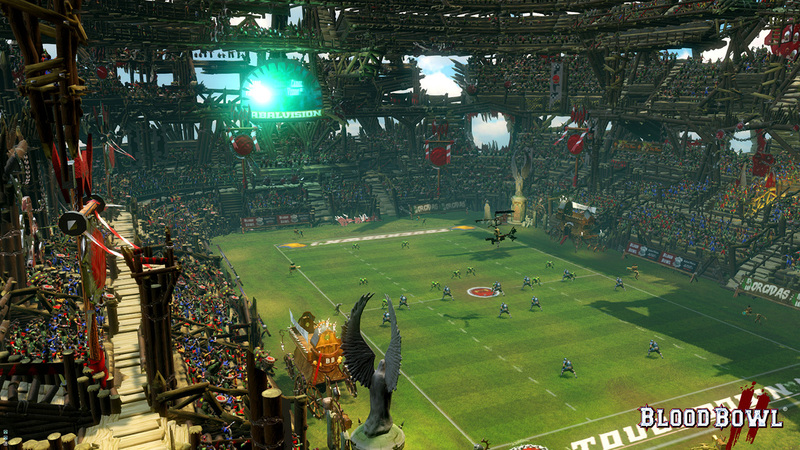 Blood Bowl 2 is a game that is full of potential, set in a world filled with character and humor. That potential is held back by the reliance on staying true to the board game experience with random dice rolls and painfully long matches. I went into Blood Bowl 2, hoping this game would go all the way. Sadly it fumbles far too often to call it a winner. Review copy played on a Playstation 4. 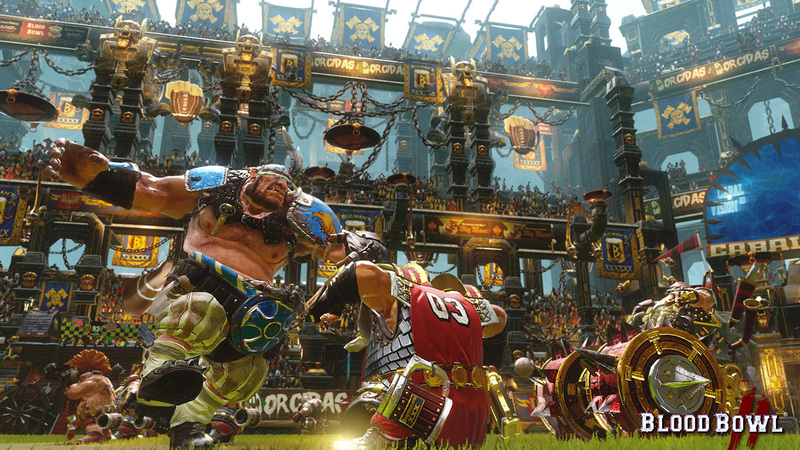 Blood Bowl 2 is also available on Xbox One and PC.